The train will have less than half the carriages it should have during one of the busiest periods of the day. Some of the busiest rush hour trains through Fife is set to be a real crush for commuters this evening, due to there being too few. The 17:16 Edinburgh to Kirkcaldy train is supposed to have five carriages, during the crucial evening journey back from the capital. However, ScotRail says the train will now only have two carriages, which is attributed to a “train fault”. Similarly, the 17:44 Edinburgh to Glenrothes With Thornton service will also have two instead of five carriages. Also, the 17:39 Edinburgh service stopping in Kirkcaldy will only have three coaches instead of four, due to “maintenance requirements”. As the evening goes on, also down from three carriages to two are the 18:01 Edinburgh to Dundee, and the 18:13 Edinburgh to Glenrothes With Thornton. 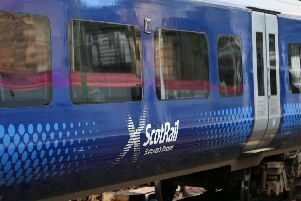 ScotRail says the shortage is a continuation of the issues faced around late delivery of the new and upgraded trains. The firm says it is training more than 20 drivers and conductors every day in orer to deliver continual improvements over the next few weeks and months.